Felt Up: But I'm Famous! PERENNIAL lover Bruce Willis, who leaves no moan unturned, turned his attention-deficit disorder to Courtney Love. He's 52, she's 42, and whenever was his birthday they discovered one another and are now sort of seeing one another. Set your clocks. Usually Mr. Bruce goes for the younger ladies (and I mean young as in Lindsay Lohan young) more akin to his daughters' peer group, but as Woody Allen says, sometimes the heart doesn't know from logic. Or sanity. Or taste. Stay tuned! 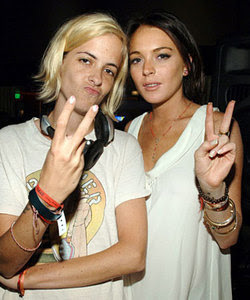 Is Lindsay Lohan more than just friends with her new best friend Samantha Ronson? Former Hollywood publicist Jonathan Jaxson says on his blog that “all my sources” insist that the Mean Girls star is getting cozy with Samantha Ronson. “Maybe she was tired of the boys and that is why she decided to spice it up with BFF Samantha Ronson,” notes Jaxson. But another source dismisses the talk. “Oh, please, that’s silly,” says the source. “Lindsay just loves to have fun and mix it up a bit. Yes, much like fame-seeking personal trainer/former Amazing Race contestant Rebecca, who is involved in a torrid ersatz lesbian affair with her boss Jackie, an actual, non-temporary lesbian on Bravo's reality show Workout (which is soooo much more interesting this season than last! yay for career-advancing sexual switch-hitting! ), Lindsay may be taking carpet-tasting lessons with professional hipster Samantha Ronson in a bid to make sure their names are not out of the press for more than three consecutive seconds. Big hairy deal! As it were. As Andy Warhol said, in the future everyone will be gay for 15 minutes. Just keep her away from Bruce Willis! Paula Abdul is a sweetie on “American Idol” — but some folks claim she’s not so sweet when she’s an airline passenger. Abdul was a diva during a recent flight, demanding — but not getting — special treatment, sources tell Star. The television show judge was booked on a sold-out Southwest Airlines flight from San Jose to Burbank, California, and reportedly demanded first-class treatment — even though there’s no first-class section on the airline. A number of fellow passengers heard the exchange, and one shouted at her: “You’re no Sanjaya! You have to board like everyone else.” That, according to the source, prompted a round of laughter from the others — except Abdul. Once boarding began, Abdul pushed her way in front of the rest of the passengers so that she did get on first, and tried to keep the seat next to her empty, telling others it was taken. Finally, a flight attendant told her she had to give up the seat because the flight was full. Abdul kept her head bowed and reportedly was “twitchy” during much of the trip. When contacted by The Scoop about the story, Abdul’s rep chose not to comment. 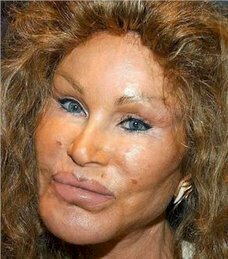 Loyal readers of Felt Up know that the only thing your humble blogette loves as much as a "dance-off," a real, low-down dirty catfight, or a Mariah Carey-caliber public mental meltdown is the classic celeb line, "Don't you know who I am?" The fact that Paula said a version of this while trying to board a flying cattle-pen makes it even better! That kind of sense of entitlement and sheer hubris is really hard to muster on a Southwest flight, when the whole airline is basically one huge coach section (and thank god for the bargain prices that result! ), but craaaaazy ole Paula managed to do it. Brava, Miss Abdul! Brava! However, most Southwest fliers are in no goddamn mood for these kinds of shenanigans, and you are quite lucky that you were not torn limb from limb in some kind of Day of the Locusts-style mob attack and then served to the passengers in tiny meat lumps in lieu of the usual salted peanuts. Wheeeeeee! So famous! I'm from Mars and I flew here on my broken wing of love and famousness! Where am I? La la la la...I'm star. So famous star. From Maaaaaaaaaarrrrrrs. Straight up now tell me...Who am I be?....Emilio? Do do do you love me? Maaaaaaaaaars! Applesauce! La la la la...Randy? Wheeeeeeeeeee! That Sam(antha) Ronson is dykerrific. Please, if you have black eyebrows and you bleach your hair yellow, lighten your brows, too, for the love of all that is good and pure in this world. And what's with the peace signs? Stoopid. I want to shake the hand of whoever told Paula, "You're no Sanjaya!" What a genius! PS: Thanks for blogging! You light up my life! Don't Be Such a Poussez! Yes, Yet MORE Celebrity Skin!